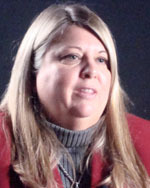 Charlotte Atkins has been the editor of the Rome News-Tribune since 2004. She previously worked at the Columbus Ledger-Enquirer as metro editor; the Monterey (Calif.)County Herald as assistant metro editor, news editor, online editor and associate editor; a decade at the Vero Beach Press-Journal in Florida as a government and political reporter, photographer and lifestyle editor, and a stint as director of a live daily television talk show in Florida. She has won numerous awards for investigative journalism, news and feature writing, headline writing, photography and newspaper design. Atkins is an Auburn University graduate. Charlotte Atkins, editor-in-chief, The Rome News-Tribune, says, “Our team members abide by rules that others don’t have to. That’s what distinguishes us from anybody who wants to set up a blog….” As for anonymous reader website comments: “They are the bane of newspaper editors’ and publishers’ existence,” says Atkins. Charlotte Atkins, editor-in-chief, The Rome News-Tribune, says, “I’m sick of hearing that newspapers are dying. The majority of original reporting comes from newspapers and newspaper cooperatives… Newspapers need to remind people what we do and how we do it,” says Atkins.